Over the weekend I was shopping at my favorite grocery store, Trader Joe's . As I was checking out, I was chatting with the cashier about out wonderful weather. Everyone in Chicago Land is buzzing about our weather lately. I casually mentioned that my birthday was this week. She stopped what she was doing, and said, "Just a minute. I'll be back". She came back with a gorgeous bouquet of flowers, handing them to me and saying "Happy Birthday!" I was speechless. I have never received flowers from anyone in the grocery store, before, and I didn't know this cashier. I know several people working there, but not this particular woman. Random Act of Kindness, that is what this was. I have since learned that Trader Joe employees are encouraged to perform Random Acts of Kindness. Trader Joe's, you now have a fan for life. You know, if you receive a "Random Act of Kindness," you pay it forward. To pay it forward, I made Strawberry Lemonade Cupcakes for the TJ crew, and took them to the store yesterday, on my birthday. The crew loved them. Maybe that wasn't such a "random" act of kindness, but I sure felt good doing it. Because yesterday was the First Day of Spring, and our temps have been in the 80's, I wanted to make a Springy cupcake. The strawberries have been delicious, and I always think of lemons for Springtime, a bright sunny flavor. Therefore, I made Strawberry Lemonade Cupcakes, and I found cute Spring themed cupcake liners, too. 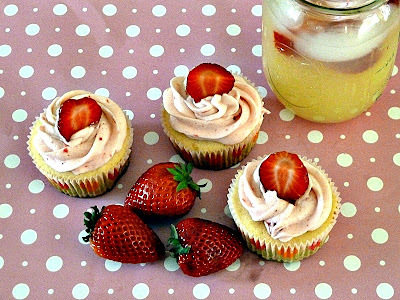 The cupcakes taste like a bite of Spring with the sweet strawberries and brightness of the lemon. They are amazing. 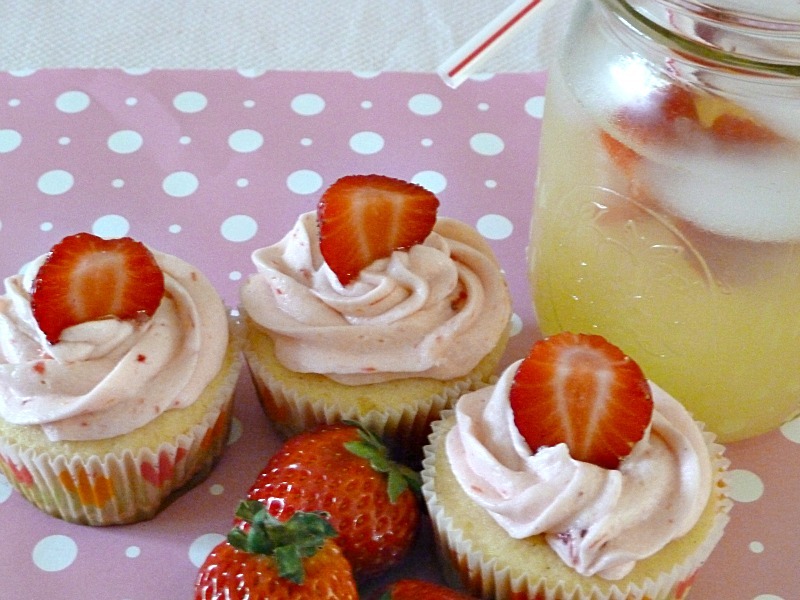 So make yourself a jar or glass of Strawberry Lemonade, have a Strawberry Lemonade Cupcake, and enjoy a taste of Spring! Add the lemon juice and vanilla and mix well. This was not a not a sponsored post, and the opinions expressed here are mine. What a great birthday story, Becky! I am not surprised that she gave you flowers...you are truly wonderful and you bless so many people! I'm also not surprised that you reciprocated with these beautiful cupcakes. Just lovely! Thank you for all of your accolades. The cupcakes are wonderful, and a bite of Spring! That's so very sweet on both sides! I agree with Monet; it's no surprise! Your cupcakes look absolutely amazing, Becky. I love the combination of lemonade and strawberry. That's so sweet of the cashier to give you flowers on your birthday and so sweet of you to make cupcakes for them in return. You just make me smile, Becky! The world sure need lots of people like you and also the cashier :D Happy Birthday again to you! Thank you for the Birthday Wishes. I had a lot of fun making the cupcakes:) and I certainly appreciated the flowers. 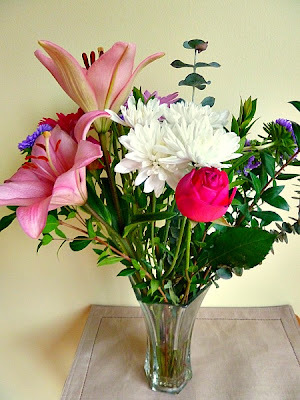 Becky-such a heartfelt, wonderful story about "acts of kindness"...first; sad to say, we do not have a Trader Joe's in our state of Florida, that I know of...and second: I have not hear of a cashier giving out such a beautiful bouquet of flowers to anyone, other than a "cookie" to a child! It was even a nicer gesture for you to make the beautiful strawberry lemon cupcakes for the crew! You are a truly good person with a HUGE heart, Becky! The cupcakes are ever so pretty, so vibrant for SPRING and so yummy with the swirl of the light frosting! Thank you for the Birthday Wishes and sweet words. One of the reasons why I love to bake is the instant gratification that I receive, when the people eat my baked goods. It's so rewarding. Such a wonderful story! Just like you did not expect the flowers I am sure that they did not expect the cupcakes. I have read some of your posts and you have reached out to fellow bloggers by sending some goodies to them during stressful times, you are a really sweet person. It is only fitting that you get flowers from someone you barely know! Your cakes with the Crystal light have really interested me-I have never used a drink mix in baked goods. They look delicious. Happy birthday! Also, right back at you my sweet friend-Happy Spring. Thank you for the birthday wishes. I had a wonderful day, and the flowers are beautiful. As for using Crystal Light or other powdered drink mixes, I think that they are just used to boost the flavor. In this case, it just gave a deeper lemon flavor to the cupcakes. I imagine lemon extract would do the same thing. Next time I might use the lemon extract. Beautiful post. Love the cupcakes and flowers. Thank you for your sweet words. The cupcakes are so good! I'm excited for you about the TJ's in S.A. It's a great place! Just like a neighborhood grocery store. These cupcakes taste like a bite of Spring, so good! thanks for stopping by my blog and your sweet comments. These cupcakes are so good! Pretty cupcakes - they look delicious! These cupcakes are so good with lots of strawberry and lemon flavor. It's stories like this that make me feel all warm and fuzzy inside. Seriously. And those cupcakes are the perfect addition to the first day of spring. I wish I had some to brighten up this rainy Vancouver night!